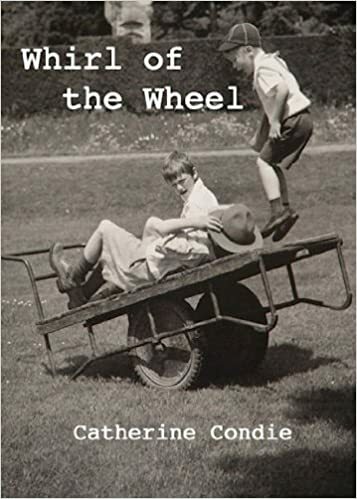 Three children whirl back in time through an enchanted potter’s wheel into the reality of evacuation in 1940s Britain . . . Whirl of the Wheel pulls feisty Connie, her brother Charlie-Mouse, and school pest Malcolm into dangers on the homefront and towards a military operations secret that will save their home. The children hit trouble when Malcolm fails to return to the present day. This fast-moving adventure will keep you guessing . . .
Veronika’s small silver medal warmed in her hand as the same afternoon she watched members of the local news television crew buzzing like bees over a lavender bush in front of the Friday market in Corberley town square. She gripped tightly, with rebounding thoughts. What had become of her? What had become of Malcolm? The producer waved his arm across her line of sight, darting this way and that over the pavement to brief the camera team. The presenter paced up and down rehearsing her lines.